It starts with a girl called Emily and her dad Scott. 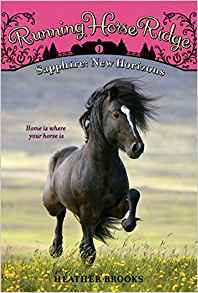 Emily goes to pony club and competes in competitions with her pony rapsodery and her dad is a business man. Scott's dad dies so they go to Scott's sisters place which is a long way. Debby the aunt lives on a horse care farm were they look after horses until they are better then they sell them. On the way, they are stopped by a beautiful black horse. Emily falls in love with it at first sight, she gets out of the car and the horse starts to lick the ice cream off her jeans. Then a girl comes and asks Emily to grab the halter so she does and gives it to the girl. When they get to the farm the house is rickety and it smells. The next day Emily runs in to the stables and says hi to the horse she saw the other day. this is the best horse book and book i have ever read in my life!!!!! !i really hope to read the whole series and tell the author to write more books to the series. She is definitely my favorite author. This horse book series is about a girl named Emma, who loves horses. i found this book before this person even wrote this review and i checked to make sure that no one had written a review!!! i sent my review to you~~~ why did you publish her review and not mine?!!!! i sent it in first!!!!!! !